Location of primary tumor in 178 melanoma patients. Depth of invasion in 178 melanoma patients. Stage I melanomas in occult (light-shaded bars) and exposed (dark-shaded bars) body regions. Background The prognosis of melanoma is correlated to the stage of the primary lesion. Tumor site has also been implicated, with locations such as the trunk carrying a worse prognosis than others (such as limbs). Hypothesis To determine if tumor thickness correlates with location in a nonvisible body area. Design and Setting Retrospective medical record review of all patients with stage I melanoma treated in our medical center between 1986 and 1994. Demographic data as well as primary tumor characteristics were recorded. Methods The skin's surface was divided into occult and exposed areas. Exposed indicated visible to the patient during routine activities; occult areas included posterior aspect of the neck, back, posterior aspect of the thigh, calf, and plantar region. Data were analyzed for significance using the χ2 test. Results Of the 178 patients with stage I melanoma analyzed, 51.1% had limb, 35.9% trunk, and 12.9% head and neck lesions. Depth of invasion was less than 0.76 mm in 32.6%, 0.76 to 1.5 mm in 25.2%, and more than 4 mm in 7.9%. In 87 patients the tumor occurred in occult areas and in 91 patients in exposed areas. Comparing the depth of invasion in these 2 groups disclosed that thin (<0.76 mm) melanomas occurred in 20.7% of occult areas compared with 44% of exposed areas (P<.05). Deeper melanomas (>2.50 mm) occurred in 28.7% of occult areas compared with 12.1% of exposed areas (P<.05). Conclusions Tumors in less-visible body areas are significantly thicker at the time of diagnosis than those occurring in more highly visible areas. Delayed detection may be responsible for this finding. Other than depth of invasion of the primary lesion, one tumor characteristic that has been suggested as an independent prognostic factor is body location.11-17 It has long been known that for some locations, such as the trunk, the prognosis is worse than for limb lesions.18,19 However, whether these differences are due to the tumor's biological behavior or simply to the time of diagnosis, meaning that lesions located in less-visible body regions are diagnosed late and therefore carry a worse prognosis, has not been investigated. Our study was designed to answer this question. The skin's surface was divided into occult and exposed areas. Occult areas referred to those body regions not visible to patients during normal activities and included the scalp and posterior aspect of the neck, back, posterior aspect of the thigh, posterior aspect of the calf, foot (plantar aspect), and posterior aspect of the arm. Exposed areas included the face and anterior aspect of the neck, chest and abdomen, anterior aspect of the thigh (including medial and lateral aspects), anterior aspect of the calf and foot (ventral), arm (ventral), forearm, and hand. These data were analyzed for significance using the χ2 test. One hundred seventy-eight patients with stage I melanoma were analyzed. There were 95 men (53.4%) and 83 women (46.6%). The average age was 57 years (range, 14-81 years). In 91 patients (51.1%) the melanoma occurred in the limb, in 64 (35.9%) in the trunk, and in 23 (12.9%) in the neck and head region (Figure 1). The depth of invasion was less than 0.76 mm in 32.6% of patients, 0.76 to 1.49 mm in 25.2%, 1.5 to 2.4 mm in 21.9%, 2.5 to 3.99 mm in 12.3%, and more than 4 mm in 7.9% (Table 1 and Figure 2). An analysis of tumor site according to a patient's ability to see it disclosed that in 87 patients the lesion was located in occult areas, while in 91 it was diagnosed on exposed body regions (Figure 1). Comparing the depth of invasion in these 2 groups of patients disclosed that 20.7% of melanomas occurring in occult areas were less than 0.75 mm, as compared with 44% in exposed areas (P<.05). In the deeply invasive groups, (2.50-3.99 and >4.0 mm), 28.7% occurred in occult and only 12.1% in exposed areas of the body (P<.05) (Figure 3). In melanomas measuring 0.76 to 2.49 mm, there was no significant difference between exposed and occult body regions (Figure 3). These differences were more pronounced in women; 15.6% of tumors measuring less than 0.75 mm were found in occult areas as compared with 46.2% in exposed body regions. In the deep (>4 mm) group, 18.8% were in occult areas and only 1.9% in exposed body regions (P<.05). An analysis of the data according to the various body regions disclosed that in half of the exposed regions, there was no single lesion measuring more than 2.5 mm in depth, while there were such lesions in each of the occult regions (Table 1). Early detection plays a pivotal role in the management of malignant melanoma. Patients diagnosed with thin lesions are usually cured by surgery alone, while those with deep lesions frequently develop metastases.7 Melanoma usually arises on a cutaneous surface. It is an unusual example of a potentially fatal neoplasm that is often visible to the naked eye. However, not all body regions are equally visible during routine daily activities. In this study, we have demonstrated that tumors presenting in occult body regions have a greater average Breslow thickness. This finding helps explain the worse prognosis associated with certain anatomic locations. 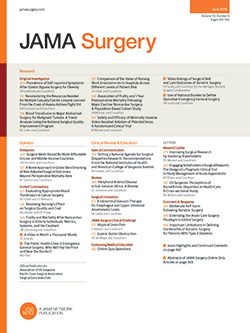 The body location of the primary tumor in melanoma has long been recognized as an important prognostic factor.11-19 Although some studies have shown in a mathematical model that once tumor thickness and ulceration are determined other tumor characteristics such as location lose their significance,20,21 others, using multivariant analysis, have shown that tumor location is an independent prognostic factor22 with trunk lesions considered to have a poorer prognosis than limb lesions. Many studies have addressed this issue but, except for tumors occurring in the plantar or palmar skin, which have an especially poor prognosis,18 the differences in prognosis could not be explained. Our study offers a partial explanation for the different site-related prognoses of melanoma. The fact that melanoma occurring in occult body regions were thicker implies that delay in diagnosis may be responsible for the worse prognosis of tumors in these locations. A prospective study involving a large group of patients who receive skin cancer screening at regular intervals would help to answer this question. Skin cancer screening programs, which include examination of nonvisible body regions, have the potential to decrease the morbidity and mortality associated with late detection. Because approximately 1% of the population will develop melanoma,23 public education regarding self-examination of the skin and screening conducted by trained professionals should be emphasized. Corresponding author: Mordechai Gutman, MD, Surgical Unit for Regional Chemotherapy, Department of Surgery, Tel Aviv Sourasky Medical Center, 6 Weizmann St, Tel Aviv 64239, Israel.